You may still be able to book by calling the hotel at 409-765-7721. When you stay at Hotel Galvez & Spa, A Wyndham Grand Hotel in Galveston, you'll be on the beach, within a 15-minute walk of Galveston Island Historic Pleasure Pier and Galveston Seawall. This 4-star hotel is 1.6 mi (2.6 km) from Port of Galveston Cruise Terminal and 4.7 mi (7.5 km) from Moody Gardens. Make yourself at home in one of the 224 air-conditioned rooms featuring iPod docking stations and flat-screen televisions. Your pillowtop bed comes with premium bedding. Complimentary wired and wireless Internet access keeps you connected, and cable programming provides entertainment. Private bathrooms with shower/tub combinations feature designer toiletries and hair dryers. Relax at the full-service spa, where you can enjoy massages, body treatments, and facials. You're sure to appreciate the recreational amenities, including an outdoor pool, a spa tub, and a fitness center. Additional features at this hotel include concierge services, gift shops/newsstands, and a hair salon. Satisfy your appetite for lunch, dinner, or brunch at the hotel's restaurant, Galvez Bar and Grill, or stay in and take advantage of the room service (during limited hours). Unwind at the end of the day with a drink at the bar/lounge or the poolside bar. Breakfast is available for a fee. Featured amenities include a 24-hour business center, limo/town car service, and express check-in. Planning an event in Galveston? This hotel has facilities measuring 4550 square feet (423 square meters), including conference space. A cruise ship terminal shuttle is provided at no charge, and self parking (subject to charges) is available onsite. 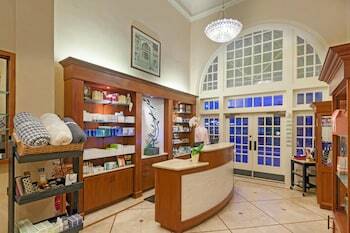 Hotel Galvez & Spa, A Wyndham Grand Hotel is a 4-star hotel located at 2024 Seawall Blvd, Galveston, TX 77550, US . Its nightly price usually falls between $107.1 per night and $654 per night, excluding tax, depending on room category. 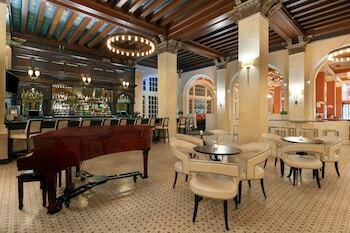 At Hotel Galvez & Spa, A Wyndham Grand Hotel, AAA members often get 7-13% off the regular rate. For example, on December 19, 2018, a AAA rate of $107.1 per night was offered. Depending on your itinerary, your savings can be more than the annual AAA membership fee itself! Many Room 77 users are able to pay for their entire AAA membership in a single stay. At Hotel Galvez & Spa, A Wyndham Grand Hotel, seniors often get 5-10% off the regular rate. For example, on December 19, 2018, a senior rate of $107.1 per night was offered. $107 per night found for a Standard Room, 2 Double Beds, City View room type. For December 19, 2018, a special AAA rate of $107.1 per night was found for the AAA Discount - City View 300 Sqft Guest Room With 2 Double - Beds Ns room type. For December 19, 2018, a special Senior rate of $107.1 per night was found for the Senior Discount. - City View 300 Sqft Guest Room With 2 Double - Beds Ns room type. Hotel Galvez & Spa, A Wyndham Grand Hotel sells rooms through sites like Room 77, Expedia, Hotels.com, GetARoom, and many others. Room 77 searches across dozens of different sites to find the lowest discount rates available. The lowest rate we've seen over the last few weeks was found on . In 1% of the cases we surveyed, all sites offered the same rate. You can compare real-time rates from all of these sites on Room 77. Room 77 is the only hotel shopping site that includes special discounts like AAA, senior, government, military, and corporate rates.